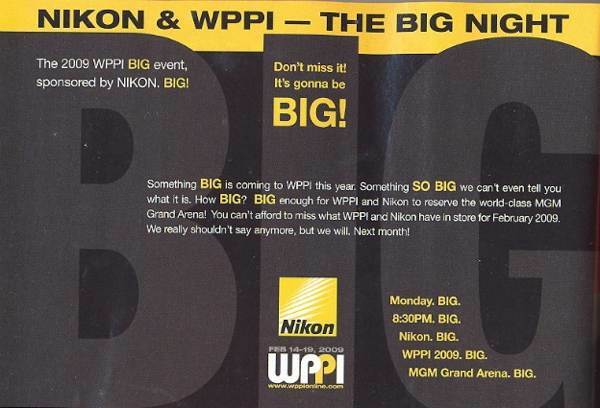 Seems Nikon’s BIG news may be out of the bag rather soon – say, October 22? According to Zoom, Nikon has given notice of a press release for October 22, which will take place in Copenhagen, Denmark. If true, I imagine we’ll be hearing more from other parts of the world soon. Nikon’s product secrecy has a terrible track record lately and I wouldn’t be surprise to see this next product leak out in the next few days. What do you think? Is it the Nikon MX format? Is it the Nikon D3x? Is it something else? Or are we all having our legs pulled? 22MP – that’s why Nikon chose October 22nd. They certainly are planning well in advance – those stickers say the hall is booked for 2009!!! October 28th, nothing with new Nikon. We still waiting.